I scored big this year, because my floors included High Water Sound's room. As usual, Jeffrey Catalano was a breath of fresh air, playing LPs of music not encountered in other rooms. First came a movement from Shostakovich's String Quartet 9 (performed by the Fitzwilliam Quartet, dressed in echt '70s slim-cut suits), which sounded gorgeous. Next, Lou Reed and John Cale's Songs for Drella, which showcased the system's strong but balanced midrange. Finally, The Cairo Gang's "At the Show," recorded in 2007 in Chicago, on which the guitar's sound was to die for. 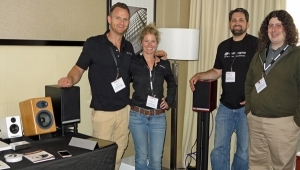 It's not just Jeffrey's unending curiosity and willingness to play great music that would otherwise remain unheard at a U.S. audio show: it's also the interaction of his choice selections with his equally choice taste for excellent equipment. 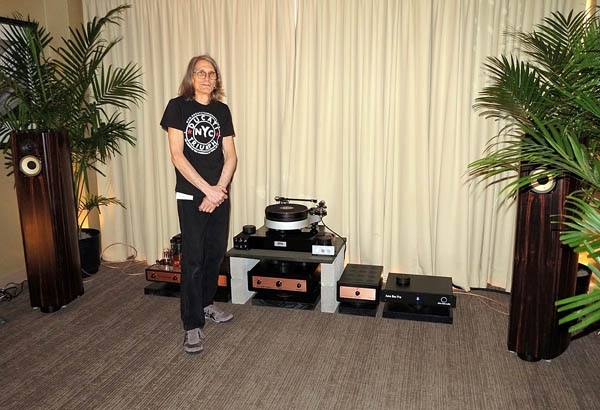 The latter in this case included the TW-Acustic GT SE turntable ($12,500) with two TW 10.5 tonearms ($5500 each); Miyajima Labs Madake/Stereo cartridge ($6000) and Zero/Mono cartridge ($2000), along with their ETR MC step-up transformer ($1995); New Audio Frontiers Stradivari line stage ($10,000), Stradivari phono stage ($11,500), and Stereo 845 SE Special Edition amplifier ($12,500); Horning Hybrid Systems Eufrodite Mark IV Ellipse speakers ($32,000/pair), Silver Circle Audio Juice Box Pro SE ($3690), ZenSati cabling, and Silent Running Audio racks and bases. Bravo! Knut Skogrand was justifiably proud of the newest addition to his cable line, the Skogrand SCD Beethoven USB. Taking its place in a system that mated a complete complement of Skogrand Beethoven cabling with the EgglestonWorks Andra III SE loudspeakers ($28,635/pair); ModWright Instruments' LS 36.5 'DM' tube preamp ($9995), KWA 150 Signature Edition monoblocks ($8995/each), Elyse Reference tube DAC ($6900), PH 150 Reference tube phono stage ($7900), and ModWright-modified Oppo 105D ($3995); TriangleArt Signature turntable ($15,995), Osiris 12" tonearm ($5800), Apollo MC cartridge ($8000), Titan SUT ($3500), and RA-8 power distribution ($3500); and Massif Audio Design component rack ($3000/each), amp and turntable platforms ($700/each), and cable risers ($50/each), the sound initially sounded a bit metallic and edgy, with a high noise floor and a lack of warmth. When Knut said, in response to my request from some non-soppy, complex classical music, "You've probably heard this 1000 times, but how about The Dance of the Tumblers," I resisted an urge to somersault out of the room and instead opted for Shostakovich's Fugue 4 in E Minor for piano. This was a far more satisfactory listening experience, with the piano sounding great. Ditto for my CD of pianist Murray Perahia playing Handel. Again, the sound was nowhere near as transparent as in some systems I heard at the show, but it was quite lovely. 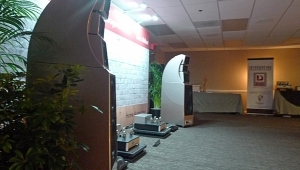 Designed by the original designer of Emerald Physics, Spatial M3 dipole loudspeakers ($2595/pair) remain among the great Plain-Jane surprises of any show. Mated with a Red Dragon S500 stereo amplifier ($1995), a full array of AntiCables Turbo 5 ($1250), MacBook Air, and Lampizator Lite 7 music server, this was one of my two Best Lower-Priced Systems of the 3rd floor. (You'll have to read more posts to learn the other.) Listening to a file of Hilary Hahn playing Bach's Violin Concerto 1, I greatly admired the lovely timbres, spaciousness, and air transmitted by this truly musical system. 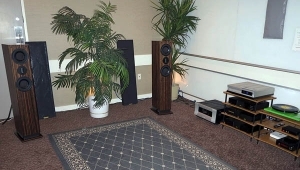 Channel D's clean, neutral, and eminently quiet presentation made great use of Rob Robinson's two-decades-old reference pair of Wisdom Audio D75 Planar Magnetic loudspeakers, which were upgraded with 21st Century technology. 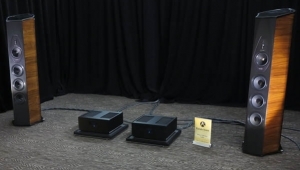 Robinson replaced the Wisdom analog electronic crossover with the digital electronic crossover feature found in Pure Vinyl, and used six output channels of the Lynx Hilo ADC/ DAC ($2500) and three stereo power amplifiers in a Hegel H20 tri-amped configuration ($6000 each). Robinson played a super 24/192 transfer of Alexander Gibson's Witches' Brew LP, which was digitized using Channel D Pure Vinyl software ($299). It sounded wonderful. Also in the system: Channel D Seta Model L phono preamp ($4998), Music Hall MMF 9.3 turntable ($2300), and Apple Mac mini ($800). Thanks to Robinson for explaining to me that Pure Music file-playback software converts Apple Lossless and FLAC to AIFF or WAV before playback rather than on the fly during playback, which means that the computer power required for the conversion process does not negatively impact the power the computer needs to deliver its best sound. 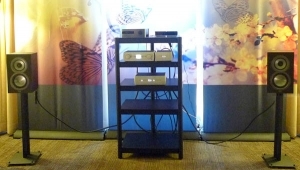 Channel D was also showing, on passive display in the Manufacturer's Showcase, their new Seta Supreme Phono preamp ($8998). 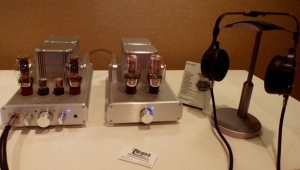 It's the first galvanically isolated preamp/ADC/DAC system that features a preamp working in conjunction with the Lynx Hilo battery powered ADC/DAC, which is also galvanically isolated from the computer. A winning system came in the form of hand-built-in-Maine Volti Audio Alura 99dB-sensitive loudspeakers ($15,900/pair), Vinnie Rossi LIO ultracapacitor-powered integrated amplifier with phono stage and DAC ($10,470 as configured), Acoustic Signature Challenger MKIII turntable ($4995) with TA-1000 arm ($1500), and the world-premiere appearance of Triode Wire Labs' Gold Statement power cord ($999), along with other Triode Wire Labs power cords and cables. Ella sounded gorgeous on her "April in Paris" duet with Louis Armstrong, with fabulous soundstaging but exaggerated sibilants on consonants. I could really hear how Satchmo's trumpet and vocals seemed all of one piece (as in: the product of the same musical intelligence and inspiration), and marvel at the natural timbral contrast between trumpet and piano. 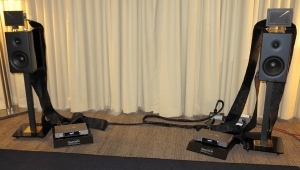 My lucky streak of great-sounding rooms continued with Hanson AV, where I encountered Magico S3 loudspeakers ($22,600/pair) connected to a Devialet D900 Limited Edition integrated amplifier ($36,900) and Aurender N10 server ($8000), with Iconoclast cabling. Also in the system were a Clearaudio Innovation Wood turntable with Goldfinger cartridge and Stillpoints supports. My equipment list may be a bit sketchy due to the exhibitor's handwritten scribble, but the sound was anything but. Everyone in the room was totally hushed as Mazzy Star performed "Into Dust" with gorgeous, mesmerizing tone. Gorgeous also seems the adjective of choice when describing the sound on Tracy Chapman's "I Am Yours." And while David Maslanka's Garden of Dreams, performed by Jerry Junkin's Dallas Wind Band, may be too derivative a composition for my taste, the timbres of acoustic instruments seemed spot-on. Not only that, but those instruments were also correctly balanced throughout the range, with none unnaturally spotlighted due to frequency imbalances. A winning system playing, for the most part, great music. 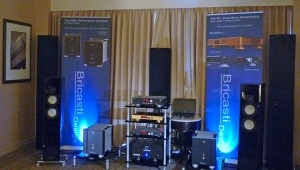 It took two trips to the Auralic room until the people running it finally ceased their non-stop sales pitches long enough to enable a serious listen. The company's new Altair wireless streaming DAC ($1899) was touted as "a perfect single-box music source" with 15 input sources, the ability to play in quad-rate DSD/DXD, and Tidal/Qobuz/AirPlay/Bluetooth/Roon readiness. But heard via Ryan 630 loudspeakers and AudioQuest cabling, the presentation seemed surprisingly flat on more than one selection. I missed the name of the first one, but a track from Queen's A Night at the Opera mixed welcome liveliness on top with a flat and color-deficient midrange. Jeffrey Catalano even looks like he'd be cool to hang with! As to the Technics, I am fascinated by the motor, but wonder where in the system their rig let you down. Do you know what cartridge they were using? Ortofon 2M Black, the top-of-the-line in the 2M series. Bill Voss of Technics tells me that the Sinatra track that was playing has a very midrange-y opening. Pure may convert FLAC and Apple Lossless, but that's due to a limited feature set, not any benefit to us. Most players handle those formats transparently with no degradation whatsoever. My six year old Logitech Squeezebox has always played FLAC. Let's not make musical file reading and decoding into a mystical exercise or we'll get into the land of $20,000 streamers being called "entry-level." If Pure doesn't have it, don't laud them for it. Ask them to step up to the technology of 2010 for goodness sake. Pure may convert FLAC and Apple Lossless, but that's due to a limited feature set, not any benefit to us. Yes, you missed something. When a lossless-compressed file, like FLAC or ALAC, is decoded in real time to present the PCM data to the USB port, there is a processing overhead that many experts feel degrades sound quality when compared with reading an uncompressed PCM file. So by decoding the complete file before playback, and reading the resultant PCM data from RAM, Pure Music optimizes playback quality. I can confirm this from my own experience. Using other playback software, I've compared the sound of an Apple Lossless file, converted on the fly, to its aiff equivalent, converted beforehand with XLD and stored on my laptop. There is no contest. The computer power it takes to convert the file during playback on my Macbook Pro unquestionably detracts from the sound. The difference is not subtle. Thank you, John, for the clarification. then its all in your head. Ask a friend to switch the same FLAC file to the uncompressed version at random if you can guess 5 out of 5 you got gear problem other than that you have good imagination. I don’t know where you obtained the information in your post, but as the designer and creator of Pure Music, I feel compelled to address some misconceptions. I think JA and JVS covered the rationale for the differences in playback when starting with linear PCM files compared to Apple Lossless or FLAC. But I also read a little more than that into your comments. - First of all, Jason probably meant “converts Apple Lossless and FLAC to linear, uncompressed PCM before playback” - not converts to AIFF or WAV. Conversion is done to RAM (in advance of playback), not to hard disk (in case there is some confusion there). Uncompressing FLAC or Apple Lossless is an essential first step in the playback process. Your Squeezebox also decompresses FLAC to PCM, through its own internal processor / firmware. Compressed Apple Lossless or FLAC cannot be “played” directly to a digital to analog converter (DAC). In all cases, Apple Lossless or FLAC is always uncompressed before being sent to a DAC (including your Squeezebox’s own internal DAC) as linear PCM. - Pure Music has handled native FLAC playback since Pure Music 1.7 in 2010 “transparently with no degradation whatsoever,” as you say - and via the iTunes user interface (via our patented technology) - that’s before any of the other Mac OS based audiophile music player software applications did. - Pure Music also was the first (on any computer OS platform, not just Mac OS) audiophile music player software to play DSD audio files (in 2011, Pure Music 1.8). Incidentally, a popular competing application still doesn’t even handle support native DSD playback yet (that is, streaming the bit perfect DSD audio to certain DACs) - 5 years after Pure Music pioneered that feature. The above timeline can be found in the Release Notes at the end of the Pure Music User’s Guide included with the Pure Music software. (One can obtain original, archived versions of the User’s Guide from the Wayback Machine at archive.org, lest we be accused of tampering with dates.) So, the others have had to catch up to Pure Music - not the other way around. A quick perusal of our website would reveal that the notion of Pure Music having “limited features” is ludicrous - especially since we led with certain features that none of the others have, and still don’t. So I think your comment about “a limited feature set” is misplaced. Jason, thanks for the nice comments (and thanks to all of our users who stopped by to say hello). 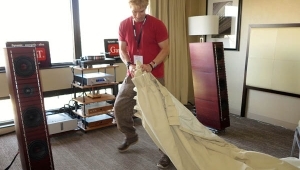 As you know, it takes many months of hard work and preparation to mount an audio trade show exhibit like this, let alone have exceptionally good sound at the show. 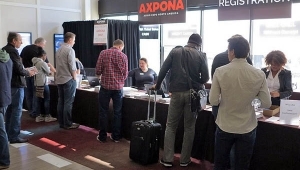 This is a daunting task, especially for a small company, yet we somehow manage; this being the 8th time in a row we have exhibited at AXPONA. 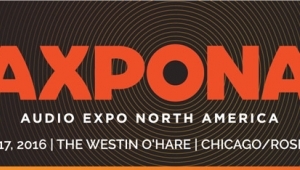 I often wonder why the other audiophile music player software companies don’t host their own exhibit rooms at AXPONA (or consistently do so at other trade shows), as well? Amarra, aka Sonic Studio, has hosted both table displays and rooms at shows, and has also shared rooms where they've had spokesmen present. I believe Jon Reichbach sat out this show because he is devoting all his time to completing a new Amarra playback platform that will have a completely new look. 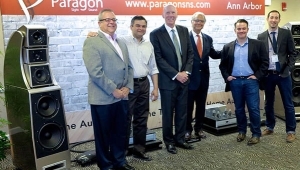 Hello Jason - of course, other companies in our market segment have hosted listening rooms. I deliberately used the word “consistently” as a qualifier. 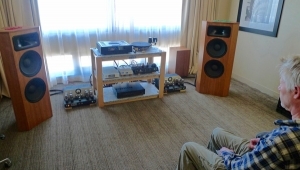 At last count, we’ve set up complete listening room systems (not table displays) at 27 audiophile expos (RMAF, AXPONA, T.H.E., Munich, etc.) 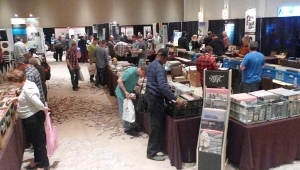 in the last 10 years (not counting when we’ve set up and staffed more than one room at an expo). That’s a lot of effort and expense. Certainly not very much as the industry goes, but viewed in the context of our market segment (“computer audio”) it is quite a lot. Thanks again for your coverage, and please accept my apology for straying off-topic in my original reply, which may have prompted your response (and this reply).